This was the summer when I was 7. Clarksville, the town just south of Louisiana on the Mississippi, had a sky lift up to a bluff with an amazing view and a cheesy fake Western town. I wish I had that dress! Today’s my birthday! My brother and family are taking us out tonight. Today will be a lovely quiet day with reading. The Mother’s Day / birthday combination was always fun when my mother was living, rather bittersweet since she died. For a change, I didn’t attempt to ignore Mother’s Day and posted a photo of us in my Sunday Salon. 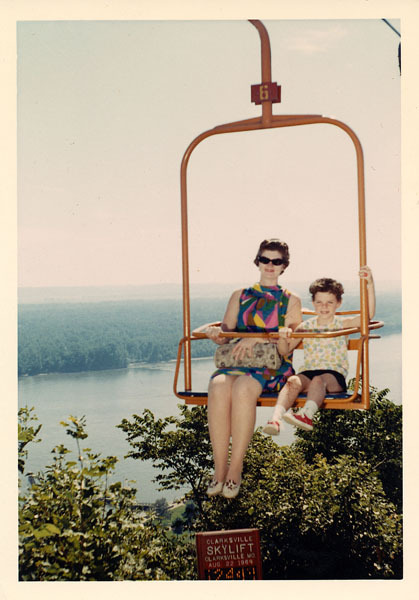 I was thinking about my mother when I wrote my Readers’ Workouts post last week, too, and ended up reflecting on how Title IX gave me a different attitude toward exercise. I attended a real-life author event on Friday night — check out the photos of Kelley Armstrong, Kiera Cass, Danielle Paige, and Kimberly Derting. 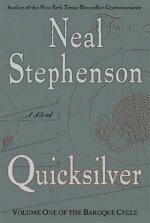 I finally finished Quicksilver by Neal Stephenson. It took me 5 days less than three months to read this 900-page novel about science, politics, and life in the late 1600s. I finished Changeless by Gail Carriger, too, and have moved on to the next in the Parasol Protectorate series. I’m putting off the decision about whether to read the next book in Neal Stephenson’s Baroque Cycle by focusing on this week’s book club selection. I’m really getting in to the history of Barbados and the New World in Sugar in the Blood by Andrea Stuart, but I’m glad that our discussion leader told us that it’s not quick to read. I think I allowed enough time to get it finished by Thursday night. On my phone, I’m reading Blameless by Gail Carriger. It looks like we’re headed off to 19th-century Italy. That should be fun! After Sugar in the Blood, I think I’ll read The Clockwork Universe by Edward Dolnick, covering in nonfiction some of the same events that were in Quicksilver. I’m going to read Ophelia and the Marvelous Boy by Karen Foxlee, based on recommendations by book bloggers that I’ve seen in the last couple of weeks. I finished Name of the Star which takes place in modern day east end London. WOW! Happy Birthday, Joy. Today is my Kiddos birthday as well. I love the picture of you and your mom (and the red sneakers are great) Hope you have a great birthday. Happy birthday! Hope you have a fabulous day and dinner out. 🙂 That author event looks neat. You are tackling heavy books. Pun, intended. Have a good week! Happy birthday, Joy! It’s also the 5th birthday of my oldest great-grandchild, so I mentioned her in my Monday Mindfulness post today. Happy Birthday! The tenth was the birthday of my hubby and daughter, so I know what it’s like to have birthdays on top of holidays. Happy Birthday! Hope you enjoyed it – and of course, that you’ll enjoy your reads this week. hope you had a great day and received a lot of books. Thanks for stopping by my page earlier. I always love talking about the books I read and I’m glad you enjoyed my pst about Mansfield Park.